Back by popular demand! The return of the World's Most Ginormous Famous Idaho® Potato Tour Truck! That's right, as part of the 2014 tour, Kristie and the Tater Team will be back in town on July 1. To see the photo gallery from the 2013 visit click here. We're currently working on some really fun things to do with the Giant Spud, so stay tuned. Sign up to our email list here so you don't miss any upcoming details! 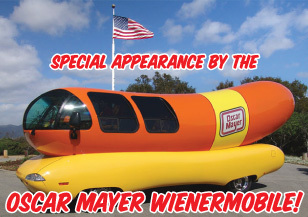 • The annual World's Largest Catsup Bottle Festival Birthday Party & Car Show was held on Sunday, July 13, with a special appearance by the Oscar Mayer Wienermobile! Here's another "Back By Popular Demand" update! The return of Bruce Forman, Pinto Pammy and Cow Bop! Yessiree, it's "Rifftime on Route 66 2014" tour. Rifftime.com is the sponsor of the tour and is creating an engaged and connected music community website supporting artists and bands with cutting edge technology and support. Check out the official tour website here at route66.rifftime.com. We couldn't be happier having Bruce, Pammy and the boys back for a visit! 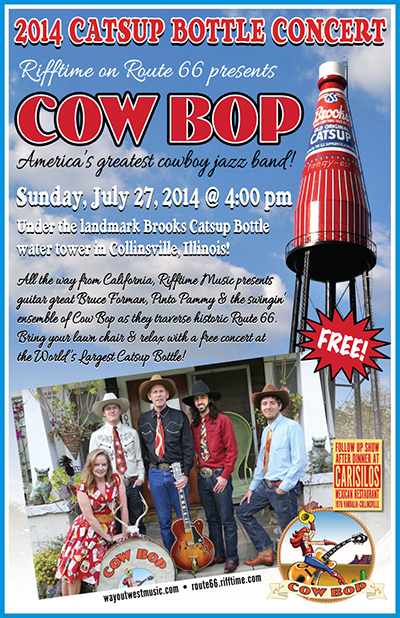 This will be the band's 3rd time playing under the Catsup Bottle. Everyone spread the word and make this time the best ever! For more info on the greatest cowboy jazz western swing combo EVER start here at WayOutWestMusic.com. And for the photo gallery from 2008 click here and for the photo gallery of 2013 click here. More details are on the way so sign up to our email list here so you don't miss any updates!